The Review:Pours a beautiful copper color with some orange hues and a very impressive off white head. The head is very creamy with just a few soapy bubbles mixed in but mostly a nice creamy head. The head diminished fairly quickly to just a nice protective film on the top with a 1/8th inch ring around the top of the glass. Looks like it should leave some lacing. The beer is very clear with good carbonation, lots of tiny bubbles rising up from the bottom of the glass. Oh those are some nice aromas coming out of this beer. Nice sweet and spicy notes. Pumpkin spices for sure but not overpowering you can still pick up some toasted malts, caramel and just a little flowering hop presents. I kid you not; my mount is watering just thinking about tasting this brew. So here we go. Wow that’s even better then it smells. Boy I’m going to have a hard time describing this one to you. Its smooth rich creamy refreshing spicy and so much more. Let me try to dissect this. You start with a sweet taste then a tingly feeling as the carbonation roles over your tongue, as soon as that starts to fade you are just filled with a very pleasant pumpkin spicy flavors and just when you don’t think your mouth could sense anything more you get the most pleasing hop bitterness that’s just enough to leave a fairly dry finish and a craving the next sip. The complete after taste that you are left with is somewhat malty with a nice spicy tingle on the tip of your tongue. This is just a very impressive Pumpkin Ale. Some of the pumpkin ales on the market are just too pumpkiny if you know what I mean; it’s like drinking a liquefied pumpkin pie. 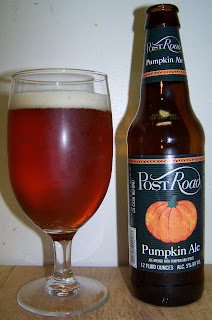 This Post Road version is a well crafted amber ale first and a pumpkin beer second. It has all of those great ale qualities, nice malts with the ale yeast leaving nice volatiles and esters to cherish, good carbonation that makes it very refreshing and behind all of that is an exquisite pumpkin spice that blends in with the beer not overpowering the beer. Sorry I just can’t say enough about how great I think this beer is. The beer is now at 64 degrees, the head is down to just a few clusters or islands but there is till a nice ring around the top at the edge of the glass. There is some lacing but not very much. Oh, it just keeps getting better as it opens up and warms up a little. It actually seems smoother now. Maybe that’s from losing some of its carbonation, although there are still tiny bubbles rising up from the bottom of the glass. Clean crisp and refreshing with a nice pumpkin spice in the background. I don’t know but this may be the perfect Pumpkin Ale for me. Well it is all a matter of personal taste and some may like that soupy liquefied pumpkin pie stuff. But I think this is it for me. This may be my Pumpkin Ale gold standard to which I compare everyone else. And this is my first pumpkin ale of the season. Ken, Josh and I were just discussing pumpkin ales at dinner the other night. I was really not interested after the convo to even want to try a pumpkin beer. I will tell you now that I will definitely try this beer. I love pumpkin pie it is my favorite kind of pie. I would not however like to drink my pie, so I think that this beer will give me the flavor without the gag. So far this is my favorite. I have another pumpkin review to post but of the 3 so far this year Post Road rules. I may do a post just about Brooklyn Brewery; there Brewmaster Garret Oliver is awesome. He really has knack in brewing beers and staying faithful to the individual style and tradition of that type of beer.